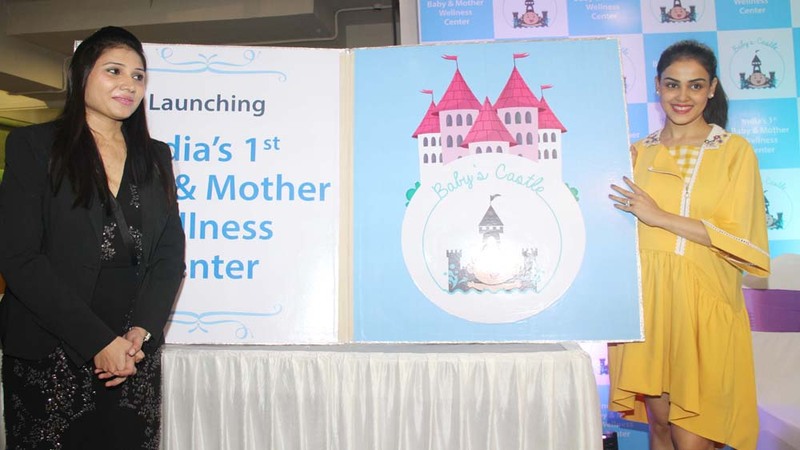 India’s first and only Baby and Mother Wellness Centre, Baby’s Castle, caters to nurturing, enhancing and advancing the milestones every baby and mother would need. What made you come up with Baby’s Castle? During my pregnancy, apart from my academic knowledge, I did plenty of research on baby-care through books and popular websites. One thing that really caught my attention and interest was the unique concept of baby spa and water baby, which is widely spread across the globe. What disappointed me was that the practice of such proven activities and facilities was missing and not recognised in India. I learned that in an age of rapid innovations and improved techniques, we continue to live in the legacy of myths & stereotype practices when it comes to baby care. As my research in the field of baby care went extensive, my urge to experience it also went deeper. Without wasting time after the delivery of my adorable son, I applied for a certified course in the US for aqua therapy and baby care. Looking at the benefits and overwhelming experiences the babies and their mothers were witnessing, this course was an eye opener for me as it made me understand the dos & the don'ts of baby care which broadly included right techniques, hygiene and ultra-care. My first intent in taking up this course was to provide my son the best pampering & care but after completing the course, I was convinced and also excited to share this unique experience with the babies and their mothers in India. Hence, the idea of "Baby's Castle" was born, where I decided to go the extra mile by designing an array of ultra-luxurious services for babies & their mothers namely - aqua therapy, massage, spa & a play zone, in a very calming, safe & hygienic environment under expert guidance. Tell us about the conceptualisation of Baby’s Castle. "Castle" stands for something priceless, pristine, precious and pure just like our centre. The ultimate reason behind baby's castle is my son. I'm pretty sure that this idea wouldn't have fascinated me if I wasn't a mother. I wanted the best care for him since his birth and soon believed that every mother desires the same. This led to a vision and the hard work turned it to reality called "Baby's Castle". What all services does the brand offer? Elaborate. We have services for to-be mothers, Mothers, Infants and Toddlers. Infant Massage: We have introduced ‘Infant Massage’ at our pristine centre. The massage which we conduct at Baby’s Castle is different from the orthodox massage. We use scientific massage techniques, using different forms of rhythmic strokes - (rubbing, hand-over-hand, percussion and kneading) that will aid mental and physical development. These massages are conducted by trained and certified nurses and massage experts under the guidance of a doctor. We also teach mothers how to massage their baby which improves mother-baby bonding. Aqua Therapy: The goals of these programs are Aqua fitness and Aqua comfort. Smart Play zone :“Floor time” with babies like playing can aid their cognitive development. Our baby centric activity zone is designed using soft play toys and bright colours that help in boosting babies’mental and physical abilities. Creative Movement: We have specially designed this program for the age group of 1.5 years to 4 years. We use specific kid's music and songs which will help kids learn the basic dance steps like jump, turnaround, heel step and free spin. This program will add on to their physical fitness and fun. Also elaborate on the products under the brand. We use the best certified baby products in the world. Our baby products are from reputed brands like Mustela, Earth Mama and Baby Angel, Honest Co., Mama Mio etc. Clients can choose from a variety of these products and find the most beneficial ones for their baby. All the products are chemical free and meet the standards of certification from AAP (AMERICAN ASSOCIATION OF PEDIATRIC). Some of our baby products have organic certifications from USDA / follow the NSF/ANSI 305 Standard and are appropriately labelled on the products. What is the pricing for the products and services like? Our price range starts 1800 INR onwards (exclusive of taxes) and varies as per the package / services opted for. What is the gap that you are trying to fill through Baby’s Castle? We aim to facilitate a wellness centre for young mother and infants by focusing on a modern approach by marrying the overall well-being of a mother and the kid through specially designed treatments and a unique bonding experience. Will this be a standalone centre or are you planning more branches? In that context, are you also looking at franchising as an option? As of now our entire focus is to spread the new concept of Baby Castle and its contemporary services in the society. Our biggest reward is the acceptance and satisfaction of our clients. Observing the tremendous response & acceptance in such a short span, we definitely intend to expand in other parts of Mumbai and India but right now all our focus is on our primary venture. How does being associated with a celeb like Genelia help the brand? We thank Genelia for her time to inaugurate this dream project, amidst her busy schedule. We associated with Genelia to inaugurate our centre because she balances her work life and motherhood perfectly well. She represents both modern requirement of being a working mother and the traditional role of being an ‘at home mother’ to take care of the baby’s day to day needs. This augurs well with Baby’s Castle’s aim of focusing on a modern approach by marrying the overall wellbeing of a mother and the kid through specially designed treatments and a unique bonding experience. Tell us about the association with Freds Swim Academy. Baby's Castle is registered with Freds Swim Academy that runs swimming academies across the globe including India. Freds Swim Academy has a European patent for a special floatation device, which helps kids as young as 6 months to learn swimming. Being associated with them authorises us to use this special device at our centre which contributes to the modern standards we follow. What do you think about the baby and mother care market of India? What changes according to you does this market need? The baby and mother care industry in India has experienced an incredible growth in the recent years. Earlier, the baby care market was in a budding stage and was not given much importance. It was considered to be a niche industry from an Indian perspective but now it is an emerging industry. Being a first of its kind offering in the baby and mother care (service) industry, we would like to see more such innovations in order to contribute to this emerging sector. Where are you seeing your brand in the next 5 years? We would like to see our brand grow and achieve different milestones over the next 5 years. We will continue to focus more on our services and gain customer satisfaction as we believe that's the most important factor for any brand in the market, to prove themselves. 'Indian healthcare needs to grow 10 times'..